Buckeye, you definitely have the x-factor. Lucky patient she is. What a strong woman. Really. Probably dealing with so much doubt for so long. Questions about her mental status, and everything that goes with that. It’s possible she might go through a bit of a breakdown, Buckeye. She’s had to be a different person to keep herself going. If she has not had support of those around her while she was without dx, she will feel tremendously betrayed. Hope she makes it through emotionally. You know you are going to be her knight in shining armor now. Great case. I wish I'll have a patient with malrotation, probably soon. Classic. Good for you she's been able to give you all the info. I don't want to assist a non-talking patient like the one I had recently. Pure torture. so inspiring .. and I will keep this lesson in mind. Thanks alot for sharing. the sbft shows the malro -- abnormal position of the djj.. cecum looks a bit high too. So glad you listened not only to her but your 'gut instinct'. I'm resigned to knowing I'll never know what my gut issues are about. They'll find it at autopsy is my mantra and I keep on truckin as best as I can. I have a suspicion that it's edometriosis tangling up my innards. Had it everywhere (stage IV) years ago and regardless of what some docs say, it never really does 'go away'. Great catch! So glad to know she must be feeling much better! I like the prone film best. The duodenum is pretty classic the way it does not cross the midline. I would give it 100% straight up. I am a 46 yr old who was diagnosed with malrotation almost 2 years ago. I have been having symptoms of intermittent obstructions for years now but due to being diagnosed with IBS by a gastroenterologist, I am having a hard time convincing my surgeon that this malrotation should be fixed. Any suggestions? I wish I lived in Ohio so you could do my surgery ...recently diagnosed with malrotation at age 50. Just a little nervous having the surgery with a doc that isn't all that familiar with this condition. My symptoms are back ache and abdominal pressure...so docs aren't convinced it's the malrotation although nothing else can be found. No pain..no vomiting...just walking around uncomfortable kinda like having a rock in your shoe. It's great there are docs willing to really listen to their patients. The docs here are good too...just wishing for more experience and/or interest in my condition. Have you ever had a patient with recurring problems after surgery? A little over nine years ago I received this procedure and have always had some issues with distention and discomfort that has gotten progressively worse. Doctors, knowing I have already had the surgery, tell me it is IBS but I am not convinced. I'm a 40 year old woman and had the LADDs procedure surgery a year ago. I had malrotation with mid gut volvulos that snuck up on me out of no where. It took several CT scans to find it. Listening to the patient and not giving up is essential. My main issue was incredible pain after eating. As food moved through bowels I felt more comfortable. Surgery performed by Colo/Rectal surgeon in Baltimore MD. Did great job. Had other surgeries due to adhesion obstructions and now diagnosed with Crohn's disease. Inflammation and strictures seen in colonoscopy. Doing better on Crohn's meds and keeping POSITIVE. So glad to see that I am not the only person out there with this "rarity". My first attack was at 19 and my first surgery laparoscopicly was at 25. Because the doctor did it laparoscopicly they missed 3 Ladd's Bands and I was in pain for 3 more years till I finally found a doctor who believed me. He went in and did a laparotomy and found a balloon in my intenstine from the Ladd's Bands strangling my intestine. The pain I endured from 19 to about 2-3 years AFTER my laparotomy was intense. All doctors would do is throw opiates at me (which only makes it worse since you're slowing down the bowl process). All I can say is: Be your OWN advocate! Own this rare condition and best of luck! I have a question, I have congenital malrotation, I had surgery when I was twelve. It took the doctors 2 years to figure it out, I have severe abdominal pain again I've been going to the doctor, having test ran etc, for almost a year. they cant find out what is wrong. I am wondering, Is it possible to have SMA syndrome and congenital malrotation. I have one Dr. telling me I have SMA syndrome and another telling me its impossible for me to have SMA syndrome because of my congenital malrotation. my 4 year old daughter was finally diagnosed with intestinal malrotation last year, after my persistance for further testing after many episodes spanning over 2years of green vomitting for 3-5 days at a time. docs told us each time she had "cyclic vomitting syndrome" and sent us home. July 2011 she underwent sugergy to correct: repositioning intestines, removing Ladd's band (huge..surgeon stated she sees this size in teenagers), and removed appendix. She is now 5 and recently has had a couple of episodes of vomitting again but NOT green (once in Feb 2012 and once in March 2012). and her appetite has drastically decreased in the last 4 weeks. what are the chances of something else going on as a result of her surgery last summer? relapse, or complication? I am crying right now writing this... This story sounds very similar to mine and i really need someone to believe that my pains are real. I will be contacting you tomorrow. I live in the akron area, been seen by countless dr;s, admitted several times just be thrown pain killers and told to go home. I NEED HELP!!!! PLEASE!!!! I had an attack last night and I can not take it any more, I have 2 kids and I do not want them to see me like this anymore. Oh and I should mention I am 29 yrs old. I had a Duedinia Atria surugery 11 years ago. That is when the complications....the attacks started to occur. I was diagnosed with intestinal malrotation at twenty one, almost a year ago. I suffered for six yeears, vomiting repeatedly after every meal. One doctor diagnosed me with "an angry belly" one doctor diagnosed me with "reverse ibs" one told me to my face i was a liar. I have been misdiagnosed with acid reflux more times than i can count. I was told that i was suffering from intense ocd and that is why i am vomitting, they actually where about to recomend therapy. After all of that they finnally found out that i had a mess of intestines on the right of my abdomen. the doctor who called me a liar was finally asked to appologize:D I am finally healthy now, but I dont believe i will fully trust a doctor again. I'm 54 and just found out today that I have congenital malrotation. I have been suffering my entire life. As I child, I was labeled a "picky eater" but I had no way to explain why food hurt me so much. I was pretty much underweight my whole life up until menopause (age 48) in which I gained 20+ lbs. and I am 5'4" and 126 lbs. I had a hysterectomy due to POP (Pelvic Organ Prolapse) 3 years ago. I have a transdermal vaginal mesh holding up my bladder. I have repeatedly gone to the doctors only to be told it could be gas, IBS, food intolerance, heartburn, etc. I've had a sigmoidoscopy, colonoscopy and endoscopy and my results always read normal. I just had a CT scan last week and it revealed my condition. I never understood why I would look so bloated and distended even after I adjusted my diet and eliminated lactose, sugar and gluten. I had an obstruction when I was 20, but they didn't come up with this diagnosis. Perhaps it was something they weren't looking for 30+ years ago. I have to admit I am somewhat relieved with this finding of congenital malrotation because it means it is real and I don't have to diminish the pain I feel every day or make excuses for not feeling well. I don't know if I will consider surgery right away, I want to try to manage the pain with exercise and eating properly and take it one day at a time. Being able to read other's stories has been very therapeutic and I'm glad I had a chance to spill my guts somewhere it would be understood. I was diagnosed with a malrotation of the cecum--where part of my large intestine along with my appendix are in the upper right quadrant as opposed to the lower right quadrant. I occasionally have some abdominal pain...usually it's associated with constipation or stress. I am ALWAYS constipated, go through bouts of lethargy and moments of feeling run-down, and have chronic lower back pain...which I've had for as long as I can remember. My main question is, Do you think this back pain is due to my malrotation? Also, where do you suggest I go from here in terms of fixing my problem? The last Dr. I met with basically said there's nothing to be done unless I'm in severe pain-at which point I would be considered for surgery. Also, I'd just like to note that I wish there was more information/advice out there for adults--I know it's rare, but some of us older folk have it!! I am 34 and just diagnosed with malrotation last week. I was already scheduled for surgery to remove a large ovarian cyst and 2 days prior ended up in the ER in so much pain all throughout my abdomen - especially the upper right quadrant under my ribs.. A CT scan reveled malrotation. I have had bowel problems my entire life - but it was somewhat manageable with diet and exercise. I am planning on contacting a pediatric surgeon to see if they know of a doctor who has treated an adult with this condition. I live near Syracuse, NY. I too have found drs so frustrating - I was told I had IBS at one point - I too wish there was a lot more info on this condition for adults. It is so frustrating - there is a fb page - that is private - Awareness for Malrotation - ask to join. Lots of others stories and what they went through. My 48 yr old boyfriend has most of the same symptoms you all have mentioned for about 5 years now. Extreme pain....some days he lays in bed just moaning all day....bloating, gas, pain after eating, he can feel things moving through is intestine and hurting. He's been to 2 or 3 gastros, had 2 endoscopies, gall bladder removal, emergency room at least 6-7 times, CTs with and without contrast at each ER visit. He's in pain almost constantly, he often induces vomiting to relieve the pressure but it comes right back, lots of burping and flatulence. He is also unemployed and uninsured now (due to being so ill) and it's almost impossible to find a doctor who will even see him, much less one who actually WANTS to help. We are at the end of our rope and, to be quite frank, he has mentioned shooting himself in the head several time (but assures me he wouldn't). He's lost about 60+ lbs. and looks like a concentration camp victim. He has family in OH and is quite willing to come there to see you if necessary. If you know of someone in Arizona that can help, that would be great too. Please feel free to contact me if you can help in any way (Karen wild-heart@cox.net). Thank you! I just had the ladds procedure on the 12th of August discharged from hospital on post op day 2 am back eating regular food with minimal pain although I did catch a NASTY cold lol I believe that it is helping me already I am having rrgual bowel movements and not feeling bloated I haven't had to take any sort of medication due to upset stomach the doctor who did my procedure did tell me he wasn't positive that the malrotation is what was causing my problem with my stomach since childhood but he went ahead with the procedure thinking I would benefit from it. 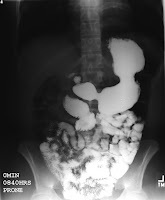 I've had same problem for 4 years it wasn't until I researched on my own under undescended cecum that I had an Barium x-ray which looks similar to the one posted in the article. I have an S-shaped large colon with several twists and looping some specialists claim my small bowell is on the left side and others contradict this. I am very confused. You sound like my knight in shining armor as all the GI specialists I've seen contradict each other--some say full abdominal colectomy is required others only a portion where I am having most pain (Upper left quad) I sympathize with the emotional state as most finding come back normal and love how you shared the need to LISTEN to your patient--I was accused of being anorexic as I've lost a great deal of weight. 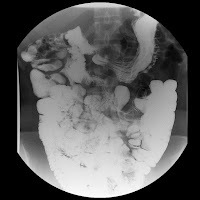 If I could I would post a picture of my barium x-ray. Love for someone like you with incredible insight and expertise to take a look. Either way inspiring article thank you--answered many prayers. I am a 30yr old female, I was diagnosed at 18 with having a form of malrotation. I then lost my insurance and never figured anything out. I've been dealing with pain/nausea/vomitting/diarrhea/constipation ever since I could remember being a small child. Finally, after 12 yrs of not having insurance I now do. I've been in and out of the ER and DRs office, no one seems to want to listen or believe me. They've done multiple CTs, blood work, colonoscopy, endoscopy,swallowed capsules, everything comes back fine. Told me I probably have IBS or I'm just constipated. I told my recent GI DR. about the diagnosis I had when I was 18. They did a barium Xray or something, that's what showed it. But this DR doesn't seem to be listening to me. It's a constant daily struggle to live life. How do I get the DR to listen, take interest, and believe? It's frustrating and scary. I don't know what to do next!